Caberfae Peaks offers several different dining options at the Peaks! Beatie’s is conveniently located just off the lobby of the MacKenzie Lodge and is open 7 days a week. The MacKenzie Lodge is located right at the base of the slopes. Beatie’s Bar & Grill offers a 30′ bar with 13 bar stools, two flat screen 50″ HD TV’s and an ever rotating selection of Michigan micro beers on tap and in a bottle. Arlo’s Ultimate Bloody Mary is also served here at Beatie’s along with Caberfae’s Famous French Fries. In addition, Beatie’s offers either a breakfast buffet or made-to-order breakfast 7 days a week. The breakfast buffet offers scrambled eggs, hash browns, biscuits and gravy, bacon or sausage, pancakes or French toast, fresh fruit, yogurt, assorted breakfast rolls and coffee for only $9 per adult and $6 for children 10 and under. The Blackmer Lodge Cafeteria opens every day one hour before the lifts open and stays open until the lifts close for the evening. You’ll be able to enjoy some of our Famous French Fries, bowl of white chicken chili, soup of the day, or a cheeseburger, all while overlooking the ski slopes. 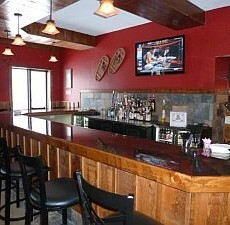 The rustic lodge is one of the best places to take your breaks from the slopes in Northern Michigan! 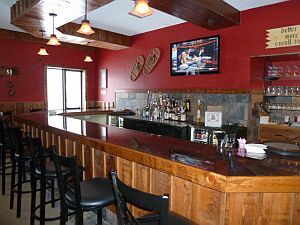 R Dub’s Pub, located on the upper level of the Blackmer Lodge, is the perfect place to grab a bite to eat and drink while you’re at the Peaks. It’s not just about the skiing and boarding at Caberfae Peaks, come join us in R Dub’s Pub for an apres ski drink or two and share stories of the day. Or, just come in to get a great meal and visit with Arlo. R Dub’s offers a fantastic appetizer, sandwich and burger menu. Come and check it out! Try out Arlo’s Ultimate Bloody Mary, the best around, and see if you can name all of his top secret ingredients! Or, try one of our many Michigan craft micro brews. R Dub’s Pub offers 8 different beers on tap, including several local micro brews from Bell’s Brewery in Kalamazoo, Short’s Brewing Company in Bellaire, Founder’s in Grand Rapids, and more!